Come join the Age Wave! The world is rapidly getting older and NARA is the networking and education hub to help your business succeed. Let us help you connect, promote and do more business! After you click submit you will be taken to a payment page where you can pay securely online. 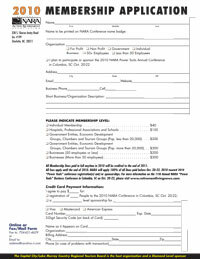 Fax to: (704) 631-4629 or mail to NARA Membership • P.O. Box 11968, Charlotte, NC 28220. We also accept phone orders with a credit card at (888)742-7362.